Pediatric nurses get to a lot of struggles in their everyday duty. 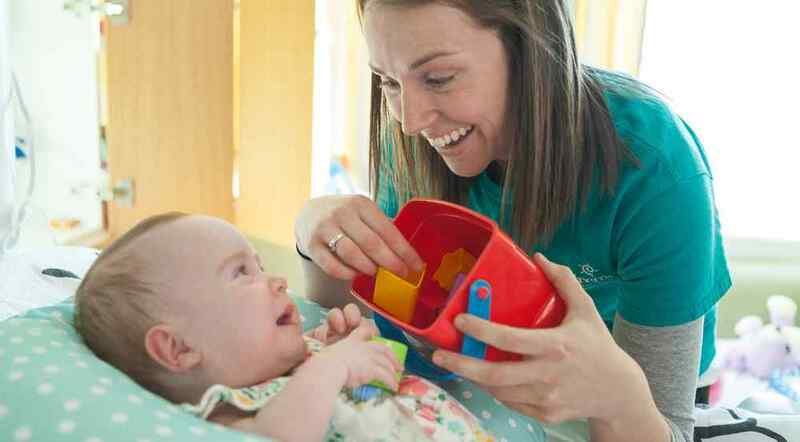 Aside from getting to meet cute kids, wearing colorful scrubs, applying cartoon band aids, cuddling babies and handing out plenty of lollipops, life as a pediatric nurse can be a roller coaster ride. Along with those colorful scrubs, pediatric nurses have to do things that could terrify kids. Pediatric nurses have to poke kids with needles in order to extract blood or insert cannulas in order to put in an IV. Problems such as holding down children in order to force medicine into their mouth or using noisy machines just to suction out booger from kid’s nose can be encountered by pediatric nurses every day. Stephane, RN, MSN, gives us a sneak peek on the everyday lives of a pediatric nurse. Stepane, was originally a business major, but then she fell in love with Nursing while on college, and now works as a Pediatric Nurse in Connecticut. She explained how she shifted from business major into nursing because she wanted something more than a job. She wanted to be more satisfied at the end of the day. And she is now working on her master’s degree. “What I love about my work are the kids. I work with kids from days old, all the way up to late adolescence. Kids are so resilient. Kids are just so scared of you, but then you have that one moment when they look at you and give you a smile and everything is okay. And that feels very special.” Stephane said in the interview. Stephane also spends her time doing crafts and dioramas and leave them at the pediatric station. “You have to keep learning in every profession because things change, and in health care, things change pretty quickly. The thing about nursing is you have to be creative on how you do things. For me, nursing is limitless.” Stephane said at the end of her video. One of the challenges that a pediatric nurse may face is the scarcity of education and clinical expertise. Nursing programs in pediatrics are very limited compared to adult nursing or specialties such as surgery. Along with this problem, clinical experience may also be limited. According to a 2002 article on the Nurse Zone website, pediatric nursing has become increasingly complex and patients who are getting hospitalized are becoming difficult to treat. One should be experienced in order to work properly and at ease in this department. What is much more difficult than general pediatric nursing are its specialties, such as pediatric oncology or caring for children with cancer. Pediatric Oncology is an area where pediatric nurses have to deal with death of a child on a regular basis. It is believed that pediatric oncology nurses suffer more stress in their workplace and may suffer from compassion fatigue. Aside from agitated children during times of getting sick, their parents are much more stressed and agitated. Pediatric nurses are the first line who encounter these parents day after day. When a child needs to be put on an intensive care, parents’ stress can often reach on unmanageable levels. During these times, pediatric nurses should be able to handle these parents and should not, in any way, add up to the stress that the parents are having. This is probably one of the most difficult task that a pediatric nurse may face. Several procedures, most especially in the critical care units, may be frightening and painful, not only for the child, but also to the parents. Pediatric nurses might need to pin down or restrain a child during procedures in the critical care or dressing change. Even in an outpatient setting where immunizations are usually done, it may still cause trauma to a child. In these cases, pediatric nurses must be trained on how to handle situations like these and not cause any harm to the patient. Pediatric nurse are those who have received specialized training with pediatric patients. Pediatric nurses dedicate their career on working with children of all ages which means from infancy up to their teens. Registered nurses working with pediatric patients involve performing examinations on patients, taking samples to the laboratory and getting vital signs. Advanced practice registered nurses often diagnose and treat pediatric patients. Becoming a pediatric nurse will require extensive education. One must learn not only the common diseases that could affect a child, but also the rare ones. Nurses should also learn about nutrition, sleep and other factors that may influence a child’s physical, cognitive and emotional development. After obtaining a bachelor’s degree, one must be able to pass the NCLEX-RN. Passing the exam and getting a license are the final challenge before being able to practice. This should measure the nurse’s ability to work, knowledge of the principles of nursing and familiarity with the basic nursing concepts. After passing the NCLEX-RN, nurses should take and be able to pass an exam administered by the Pediatric Nurse Certification Board. This exam certifies mastery on important topics that pediatric nurses must know. This include performing duties, illness management, health promotion and health restoration. After getting the standard certification in pediatric nursing (CPN), one may still gain more advanced certification under pediatric specialties such as emergency nursing, primary care, behavioral and mental health care and acute care. How much does a Pediatric Nurse earn? According to Nursing Journal website, pediatric nursing positions usually earn $52,000 to $88,500 on average. US Bureau of Labor Statistics predicts a growth in the demand of pediatric nurses by 2022 as many young patients require intensive and complex care nowadays. Being a Pediatric Nurse is difficult but fulfilling and fun. Caring for a pediatric patient will also mean taking care of an entire family, allowing you, as a nurse, to develop relationships and understand patients. According to Sarah Gray, another Pediatric Nurse, her job allows her to be more patient, kind, empathetic, light-hearted and open-minded. At the end of the day, what matters the most is being able to help the patients which will always be a part of our job as nurses. Accomplishing our roles and duties as nurses and a sense of fulfillment will be the things that even all the money in the world cannot buy.